Download Dream Builders Realty's free Central Florida Neighborhoods eBook! 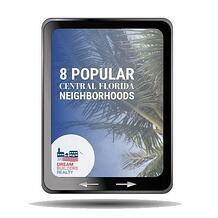 Download our 8 Popular Central Florida Neighborhoods eBook! This free eBook offers valuable information on 8 Popular Central Florida Neighborhoods and why you may want to choose one of them to call home! Central Florida and the special amenities each one has to offer.